Yesterday I was fortunate enough to watch the surprise celebration of Oprah's last show and it was extremely moving. This is a woman who literally came from nothing. She was dirt poor and truly was raised in a family that taught her about struggle and humiliation from the very beginning. The amount of adversity that she had to overcome is just staggering. I have been following the goings on of Oprah for at least 10 years and I am proud to say that the example that she has set as a human being cannot be described in words. 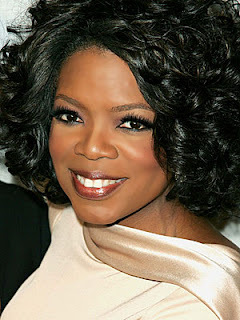 Oprah give new meaning to the phrase, "Generosity generates income." I believe with all of my soul that she was never interested in making millions of dollars. In fact, I do not think that she could have possibly imagined that her life would ever propel to this level. At a certain point in this amazing ceremony yesterday, there was a digital presentation of all the students around the world who's educations were funded by Oprah. I believe the number was about 630,000 or more. That is a number that cannot be properly commented on in any way. I know that there were many other people who had to offer their time and energy to make this happen, however, Oprah's soul was at the fulcrum of it all. She has the power to champion her resources and make it all happen. I receive her magazine at my home every month and I can say without hesitation that each and every issue has given me something to feel, think about, or to pay closer attention to consistently. There is a colossal message in this spectacular woman's life. If you do not have, it seems that you cannot give. However, the truth is that when you give consistently from any level, and get yourself out of the way, you begin to have more and more and more. This does not mean materialistic things, although that tends to be a by product of this energy. Just think of the gifts that Oprah has received over the years just for being who she is already. In closing, I just want to express my sincere graciousness for this woman and her contribution to the human spirit. She has never claimed or even tried to act perfectly for the camera or in her personal life. She even released her journal entries from when she was a young girl recently!! Who does that when they are at her level? I believe at the core of our souls, we all crave to elevate our souls to her level in our own way. Unfortunately, we have been blocked by others in several ways, and have continued to believe that we are not capable of greatness. If you feel that you cannot accomplish your life long dream or that you cannot find your life partner or that you cannot reach the level that you strive for, borrow some strength from Oprah. Read her magazines back issues, watch her "OWN" network, or even buy one of her books. Service to many leads to greatness without a doubt. Thank you Oprah Winfrey. Your soul has moved millions of people and we truly appreciate you.We look forward to your future endeavors.